Home » Blog » About Murpha » Hello Murpha! This is a blog about me, my Land Rover and....well, I don't actually know yet. Let's see how we go, eh? Immediate plans include a few articles about the vehicle, what I've done so far with it and what I plan for the future. Hopefully, in a couple of year's time, I'll read this back and think it's pretty awesome. I hope to inspire myself to do more and if I inspire anyone else to do something, even better. Just don't blame me for the fuel bills, damp seats and bruise on your hip from where the door swings and hits you if you don't get in your Land Rover quick enough. It all comes with the territory. 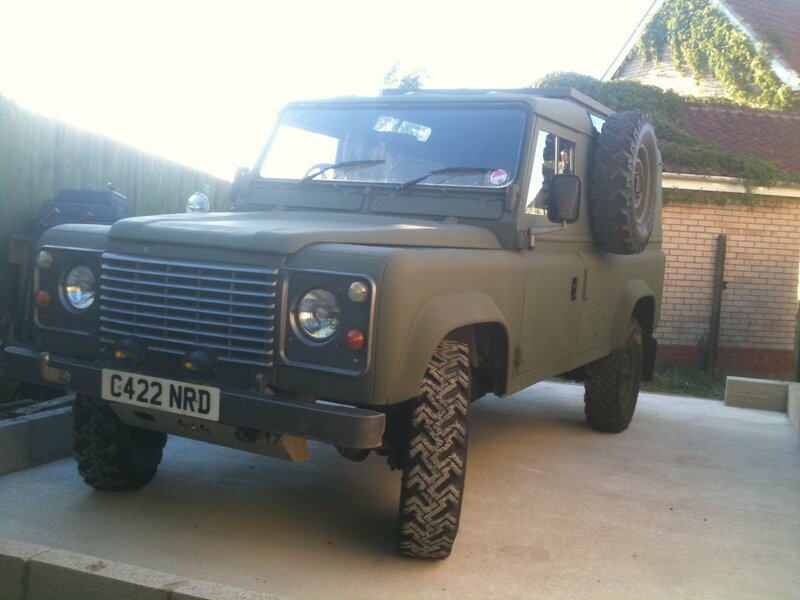 Murpha is my 1985 Land Rover 110. Don't ask me why I gave a vehicle a name. I really don't know why. I do know how the name came about, however. My surname is Murphy and the Landy, to me, was the 'Big Bertha' of cars. Murpha rhymed with Bertha and that was that; a name was bestowed upon one of Solihull's finest and a new friendship was formed with this Essex exile. I remember getting Murpha. It was May 2011 and I was away in Kent, fishing. I was bored and harboured an interest in Land Rovers. My friend, Rob, had one and, if I'm honest, it's the sheer size of them that initially appealed. Anyway, fishing was slow and I was flicking through the eBay app on my iPhone and saw this 'military-looking' beast of a thing for £1700. “That's not out of the question,” I thought to myself. I then read the description and the seller was in Ipswich. BONUS! Although 120-miles away from where I was fishing, Ipswich is less than ten-miles from my house! I read the listing closely and the seller was open to swaps. This is something that is against eBay policy and you would get no protection if you did such a thing.....but, hey, life's for living and I contacted the seller. It just so happened that I had an old Mitsubishi Lancer Evo IV parked on my drive. I'd had it for a few years and couldn't be arsed to MOT it to sell. It was probably worth more than £1700, but like I said, I was bored, so I contacted the seller. A few emails were sent back and forth and, next thing I knew, I'd set up an appointment to see this Land Rover. Knowing sweet F.A. about these vehicles, I contacted Rob (the mate I mentioned above) and asked him if he would mind coming to take a look at it for me. He's an obliging chap and agreed. I don't think I've ever been so excited when packing up my fishing gear and driving home! A quick drive around the block (by Rob, not me...I was too much of a wimp!) and we agreed the deal. A straight swap. Some of my 'fast car' mates said I was mad. The Evo was worth much more, so they told me. They were probably right; if I could be arsed to get it through an MOT, list it for sale, deal with the tyre-kickers, etc. I really could not be bothered. I enjoy life. It's too short to spend on shite you don't enjoy. I did the swap and, 18-months later, as I sit here typing this, I can tell you that NOT ONCE have I regretted it. Even when things have gone wrong, which I'll talk about in later articles, I've never thought to myself, “Damn! I wish I'd kept the Evo.” I'd been there, done that, as far as quick Japanese cars go. Besides, I had a V8 hot rod in the garage and, unbeknown to me at the time, a V8 Maserati on the horizon. You could say that cars are my thing! The guy I did the swap with was what you would call a 'lovable rogue'. If he ever reads this blog, I don't think he'd disagree with that. He freely admitted he'd been a bit of a bad lad and was trying to make amends now by doing right by his family. Fair play to him – we all make mistakes and it's who we are today and tomorrow that matters, not what we were in the past. Now, I'm not saying he drove Murpha to my house and then drove the uninsured, untaxed, un-MOT'd Evo home, but the two vehicles miraculously swapped place and I had a bloody great matt green lump of metal where the smaller shiny silver one used to be. No going back now. Hello, Murpha, welcome to my world.